Bach Dang Street is considered as the most beautiful road in Danang City. It has been built from a very long time ago since the French colonist was still in Da Nang. Why Bach Dang Street is special ? That is the reason why Bach Dang Street still has many old French architectures like Champa Graving Museum and the City Library. Formerly, the road was called “Quai Courbet” which means the riverside road, but in 1956 its name was changed to Bach Dang Street and that name has been remained until today. The road has only one direction that runs along Han Rivers with the large sidewalk for the people to witness the magnificent scenery of the river and the city on the other side. Also, from 7 pm every day, the road turns to be a walking street with the appearance of many services and attraction like shopping areas, entertainment areas and traditional culture areas. What to explore at Bach Dang Street? Located at 74 Bach Dang Street, Indochina Riverside Tower is worth paying a visit. It is a 25 storey building which is mixed used as condominium apartments with high-quality retail shopping, gourmet café and first class office space. As open day and night the whole week, Indochina Riverside Tower satisfy visitors with luxurious café, restaurants and premier shopping stores mainly focusing on famous fashion brands and personal accessories. Besides, in the 4th to 24th floors of the tower are 95 condominiums well equipped boasting stunning views of the Han River, Danang Beach, the Cham Islands, Marble Mountains and the Pacific Ocean. The fitness center, club house and swimming pool are also available on the 3rd floor, which makes it become an international standard residential tower first built in Da Nang city. If tourists prefer affordable places for shopping, Han market can be a good choice. As one of the biggest markets in Danang, it supplies a wide variety of commodities such as fabric, clothes, footwear, fresh fruits, flowers, fish sauce,... with reasonable prices. In addition, there are many other shops, cafés, restaurants, hotels, bookstores,... along Bach Dang Street, offering heaps of entertainment services for everyone. Walking along Bach Dang Street, visitors can see the Han Bridge which has long been a pride of the city as it is the first rotating bridge in Vietnam. Being put into operation on the occasion of the anniversary of Da Nang's Liberation day, it functions as the connection between two banks, playing an important role in the development of the city. At night, the bridge is sparklingly lit up, boasting its attractive beauty on Han River. Its axis begins to swing at midnight when every vehicle is banned from crossing the bridge to let shipping traffic pass along the river. 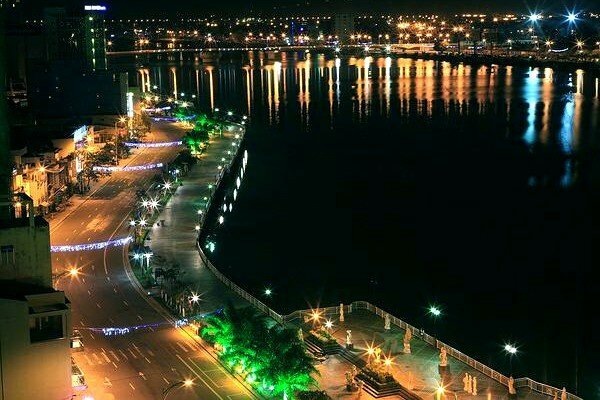 Making a tour along Bach Dang Street will help tourists discover the life of residents as well as the beauty of the coastal city of Da Nang. How to get to Bach Dang Street? The best way to get the street is by taxi or motorbike. It takes 12 mins driving from Da Nang International Airport and 9 mins from Da Nang Train station. A good place to observe the local life. Pay attention to your kids as they can get lost among hundreds of people. There are many hotels around this street so you can stay in one of them as they give the spectacular view at night. If you go by motorbike, you can park near the street but no one can guarantee for it. The best way is coming here by taxi or walking.